Save the Dunes and our partners work tirelessly to eradicate invasive species from our beloved natural areas. We prioritize invasive species control because they are an aggressive threat to our native plants and their ecosystems in the dunes, wetlands and forests. If we stopped controlling their spread, we would soon lose many of the diverse species that characterize and sustain dune ecosystems. Indeed, Save the Dunes and our partners collectively spend MILLIONS of dollars every year to restore damaged areas and keep invasive species out of the dunes. 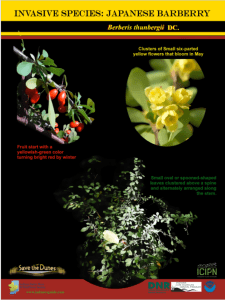 Several plants listed in the rule, such as Japanese barberry, Asian bittersweet, and Amur honeysuckle, are a huge thorn in the side of conservation efforts because even if we eradicate them, when they are sold and planted, they inevitably escape back into our natural areas. This endless battle could be over if you voice your support for the Indiana Terrestrial Invasive Plants Rule! The public comment period on the rule is only open until December 20th, so please take a minute to visit the website and make your voice heard today. We need you to express how important it is to stop the sale of invasive plant species and finally control a threat that keeps coming back year after year. Our natural areas deserve our protection. Invasive species are a threat and their sale must not be permitted in Indiana. Please adopt the “Terrestrial Invasive Plants Rule” as soon as possible. This rule will serve as a first line of defense against more invasive plants invading our wild places. I strongly support the “Terrestrial Invasive Plants Rule” because it will protect our natural areas from invasive species. Please adopt this rule to ensure that plants invasive to our natural areas are not sold in the state of Indiana. Invasive plants pose a serious and ongoing threat to our natural ecosystems. I therefore support adoption of the “Terrestrial Invasive Plants Rule” because it will stop the sale and trade of invasive species in the state of Indiana. Thank you for all that you do to preserve, protect and restore the dunes!